As per the title, what is this new feature? The Linked sidebar is very straightforward: it gathers up any links to this question provided by the community via comments, answers, or questions, and presents them in simple list format on the right-hand side of the question. It’s important to note that these links are bi-directional — that is, if another question links to this one, the link will be listed on both questions. Unintuitive as it may seem, if the question or any of its answers link to another SO question, the link will automatically appear in the Linked sidebar. Also, the link will work backwards - if you go to that question, you will see a link here. Not the answer you're looking for? Browse other questions tagged support linked-questions . 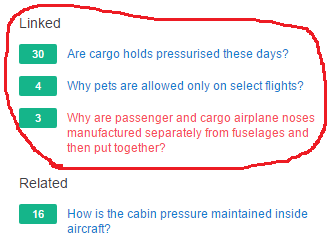 What does it mean, that two questions are linked? How to make a question appear on the “Linked” list? A better notification of significant modifications on the trilogy?